While we often think of children suffering broken bones later in their development, many newborns sustain fractures, including skull fractures, during labor and delivery. In fact, head injuries are among the leading causes of long-term disability and death both in infants and older children, according to Johns Hopkins Medicine. In a sense, vaginal deliveries are an inherently traumatic process. Infant bodies are placed under extreme stress, pushed outward by repeated contractions but restricted by the natural structure of the birth canal. Most children are delivered head-first. The head also happens to be the largest part of an infant’s body. As a result, an infant’s skull bears the brunt of these mechanical forces, compressed, in particular, by the mother’s pelvic bone. Fortunately, a baby’s skull isn’t built like the skull of an adult. If it was, vaginal delivery would be extraordinarily difficult, if not impossible, in the majority of cases. Most importantly, the skull is not one single bone. In the beginning, an infant’s skull is actually made up of 5 major bones, which are connected to one another by seams of fibrous material. These seams are called “sutures.” Over time, the sutures will close, coming to form the continuous and rigid bone that we usually think of as a skull. During early childhood, however, the flexibility of skull sutures is extremely important. As a child’s brain develops, it gets bigger. The skull needs some way of expanding, to accommodate the growing brain. Sutures are the solution, allowing the bony plates of the skull to move in step with brain development. Once the brain has finished growing, the sutures close and the skull becomes solid bone. The sutures are also crucial during delivery, at least vaginal deliveries. As it fits through the birth canal, a baby’s head is squeezed, literally “molded” into new shapes by the pressures of delivery. The sutures make this possible, allowing the bony plates of the skull to move and, in some cases, even overlap. This is why many infants are born with oblong, or “cone-shaped,” heads. Ironically, abnormally shaped heads are totally normal after birth. An uneven head alone is not necessarily a sign of skull fracture. The term “fontanelle” is usually used to describe two soft areas on a newborn’s head, one in front and one in back. These spaces are where multiple sutures come together to create large gaps between the bony plates of the skull. Sometimes, you’ll see “fontanelle” used as a synonym for “suture,” but the definition we’ve provided is more accurate. How Common Are Neonatal Head Injuries? As most parents are aware, babies’ heads are unusually soft. We’ve just found out why that is, because the skull hasn’t yet fused together and the bony plates of the skull aren’t completely ossified. While these features are necessary evolutionary solutions to the problem of delivery’s mechanical stresses, they also make the infant skull vulnerable to injury. Doctors have long believed that infant skull fractures are extremely rare, at least for children born in spontaneous vaginal deliveries. In reality, the rate of skull fractures among newborn infants may be significantly underestimated. According to researchers at South Korea’s Ajou University, a significant proportion of infants could be sustaining incomplete, or greenstick, skull fractures that go undiagnosed. 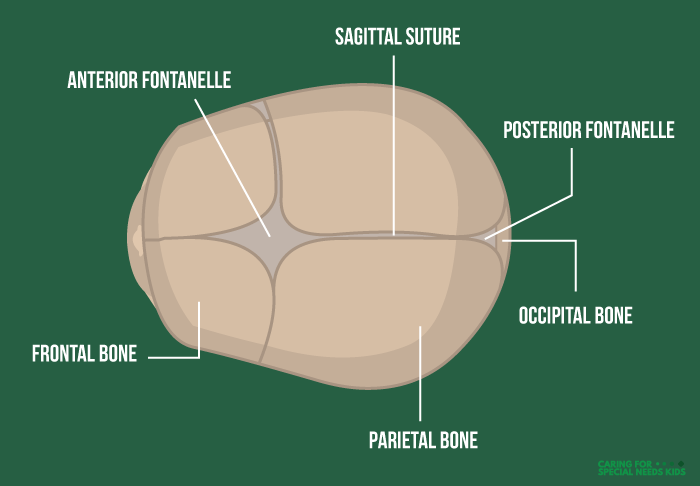 A baby’s skull isn’t “ossified” completely; it hasn’t yet turned into rigid bone. This can make diagnosing skull fractures extremely difficult, especially when doctors only use an X-ray to investigate the extent of birth trauma. With soft, flexible bones, many infants will suffer incomplete fractures, but these breaks can be harder for physicians to notice. Diastatic fractures lie across the line of a skull suture, pushing the bony plates apart. Infant skulls are most vulnerable to this kind of fracture, since the skulls in most adults have already fused together. In young infants, unrecognized diastatic fractures can soon become “growing” skull fractures, in which the fracture continues to enlarge after initial trauma. Usually accompanied by tearing in the brain membranes, a growing skull fracture can even lead to herniation, when portions of the brain or internal membranes begin to bulge through the opening. Depressed (or “ping-pong”) fractures occur when the break forces the skull downward, like an indentation. These injuries can be very serious, since the skull can actually apply pressure to the brain, requiring surgical intervention. Linear fractures occur when the bone splits, but doesn’t move out of position. Linear fractures tend to heal of their own accord with proper medical supervision. The key to a linear fracture, however, is in its name. These fractures occur in a line. Basilar fractures are defined by their location. Any break in a bone below the neurocranium fits into this category, including fractures in the eye sockets, nose bones, ear bones or back at the occipital bone, which forms the bottom portion of the skull above the neck. That last type of fracture, a basilar fracture, suggests an important point that we should emphasize: the skull isn’t just the bony thing at the top of your head. That’s only one part of the skull, the neurocranium, so-called because it covers and protects the brain. The viscerocranium, on the other hand, serves to structure the lower face and jaws, but it’s very much part of the skull. Greenstick fractures are incomplete. Instead of breaking into pieces, the bone bends and cracks, but this crack doesn’t extend the entire length of the bone. In adult bones, which are hard and rigid, greenstick fractures are uncommon. They are usually pediatric fractures, since infant bones are soft and relatively flexible. Complete fractures happen when the bone is snapped into separate pieces. In addition to these categories, we also have comminuted fractures, in which the bone breaks into three or more pieces. Skull fractures are likely most common during difficult deliveries, especially when a protracted labor indicates the use of birth-assistive devices. Long deliveries already increase the risk for a skull fracture, since the child’s head is being put under stress for extended periods of time. Combined with the inexpert use of forceps or vacuum extractor, the risk only increases. Cephalopelvic disproportion, in which there is a “mismatch” between the size of a child’s head and the size and shape of the mother’s pelvis, can also put children at risk of sustaining skull fractures. When birth complications pose an unreasonable risk of harm, an emergency c-section may be indicated. The signs of a skull fracture will differ based on the injury’s severity and location. Some babies go home with their parents and seem fine for months, until the development of seizures or a missed developmental milestone clues their family in to a potential problem. Where minor fractures are concerned, a child can look fine on the surface. In fact, they may seem fine in every way, even though a fractured bone lies below the skin. Babies who suffer head trauma are “frequently asymptomatic,” doctors at Harvard Medical School report. In short, they don’t show any symptoms of being injured. Severe fractures, on the other hand, may be evident on physical examination. In some cases, physicians will be able to diagnose a broken skull bone simply by palpating (or feeling) a child’s head. Likewise, physical deformities can be visible from the outset. Some children will have raised bumps, swelling or bruising that may or may not indicate the presence of a fracture. Most doctors, though, will rely on diagnostic tests, like an X-ray or CT scan, to see inside a child’s head and identify signs of injury. Further testing of this sort can be used to examine the existence and extent of brain damage that may have been caused by the fracture, along with the effect an injury may have had on blood vessels in the brain. As an ongoing monitoring process, doctors usually take routine measurements of a child’s head to track buildups of fluid inside the skull. After suffering a skull fracture, some children will begin to experience the early effects of neurological damage. Vomiting is common in infants, while older children may begin to complain of headaches. Seizures are a frequent sign of brain damage in all ages. In babies, a common response to the early stages of brain damage is the development of low muscle tone, a loss of tension in muscle groups. Young children may appear “floppy,” like rag dolls unable to use their limbs with any precision. Parents and medical professionals should also be on the watch for focal neurological deficits, brain impairments that affect the function of specific body regions. Depending on the brain region under stress, infants can develop paralysis in a single arm or leg, impairments in eye movement and other localized reactions. Basilar fractures, which involve the bottom portions of the skull, present their own unique signs. Bleeding and bruising around the eyes, nose or ears is common. In some babies, the coating that surrounds the brain will also be torn, allowing cerebrospinal fluid to leak through the ears and nose. The most significant risk posed by a skull fracture is brain damage. Broken bones can lead to intracranial bleeding, which puts undue pressure on a child’s brain. In some cases, the brain is actually pierced by a shard of bone, or pressed down upon by a portion of bone that has become deformed through brute impact. No matter the precise mechanism of injury, traumatic injuries to the brain can lead to long-term neurological damage, including permanent disorders like cerebral palsy. Children with severe head injuries early in life can suffer from seizures and may live at an increased risk of developing life-threatening infections, including the brain infection known as meningitis. Isolated damage to specific brain structures can lead to permanent focal neurologic deficits, in which the impaired nervous system function causes disabilities in related organs or muscle systems. Paralysis in a single arm and Horner syndrome, in which the eyelid on one side of a child’s face droops, are relatively-common examples. Minor injuries, particularly fractures of the linear type, don’t usually require medical intervention. While children should be observed carefully for signs of trouble, simple, small fractures tend to heal on their own. Intracranial hemorrhage (bleeding in the brain) and / or more severe fractures change the picture. The first step in treatment is to manage any swelling or bleeding inside the skull that could place pressure on the brain. The brain may or may not be able to reabsorb the fluid, depending on the amount of leakage. In serious cases, surgeons may have to intervene to relieve the pressure, either through a spinal tap or a shunt (tube) inserted in the brain, Medline Plus reports. Significant blood loss may call for a blood transfusion. When doctors suspect that a child has sustained a skull fracture, they should do everything in their power to properly diagnose and treat the injury. At the least, careful observation is warranted.